Hidden Mickey: a representation of Mickey Mouse that has been subtly inserted into the design of a ride, attraction, or other location in a Disney park, resort, or property. Imagineers and cast members have found ways to plus the magic by hiding Mickey in all sorts of unexpected places, and in a variety of shapes and designs, throughout Disney properties. I previously wrote about searching for Hidden Mickeys in one of my earliest blog posts, and then again here, and I included a photo of one of my favorites here. 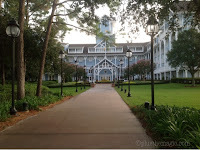 Today, we'll head over to one of my favorite resorts: Disney's Beach Club. The Beach Club, located on Crescent lake in the Epcot resort area, is home to several Hidden Mickeys. The Solarium is a relaxing room just off the lobby, filled with chairs, couches...and paintings. It's here- in the paintings- that you'll discover several of Beach Club's Hidden Mickeys. Can you spot them? There's a lot going on in this painting, which depicts vacationers from days gone by arriving and departing near the Beach Club's portico. The cars are the key to the Hidden Mickeys here. Make sure to examine the hood ornaments and hubcaps! Wow, love all the hidden Mickey's, so cool. I think my favorite is the one in the clouds :). These hidden Mickeys are great! I especially love the ones in the paintings!